Hello KCON-ers! Can you believe #KCON17LA is less than a month away!? We definitely can’t! What’s neat about KCON is that it’s a spectacular event that is a convention by day and a concert by night! If you’re not able to join us for the concert, there’s still a lot of fun in store for you, at the convention! Come meet a fellow KCON-er, enjoy some awesome panels and workshops with all your favorite special guests, and check out all the booths! 1]. Where is the convention? The Convention will be held at the Los Angeles Convention Center, West Hall! 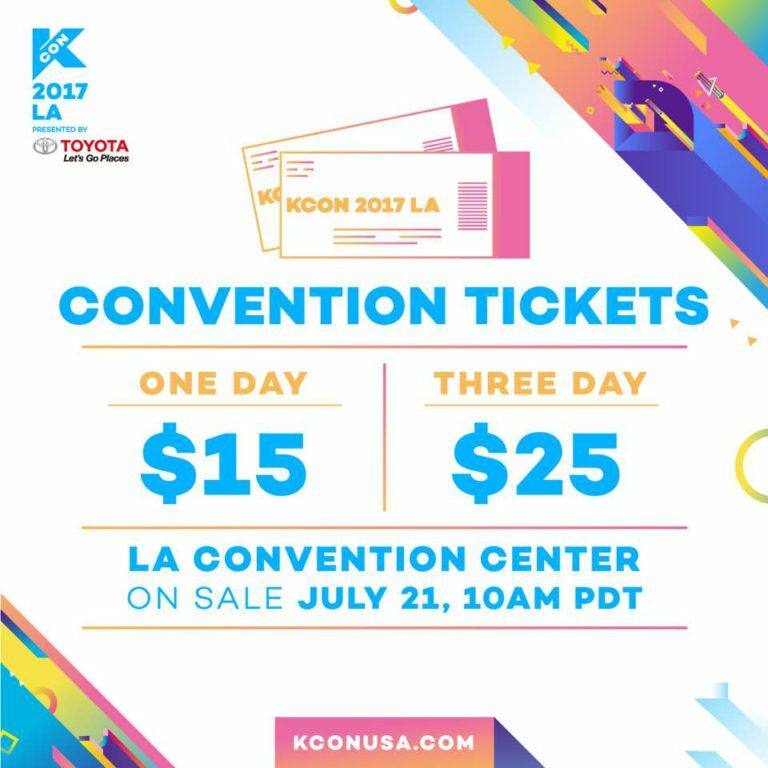 Purchase your Convention tickets at http://www.kconusa.com/kcon-la-attend/. 2]. What are the convention hours? 3]. How much is the convention and when do tickets go on sale? *Please note that Diamond and Platinum concert ticket holders receive free access to the Convention, but they must register online first! 4]. Can I purchase two one day tickets? 5]. Are convention tickets refundable if I am unable to attend later on? Unfortunately there are no refunds for Convention tickets once your transaction has been completed. 6]. What is the Flower Boy Café and how can I purchase a session? Inspired by a culmination of K-Pop/K-Drama’s flower boys and the uniquely themed cafes in Korea. Flower Boy Café features a full roster of charming Flower Boys and surprise guest appearances! You may purchase tickets during the “additional options” section when purchasing your Convention tickets. Each ticket includes 1 beverage. You may purchase two sessions (you will select the date and time of each session, upon availability) and all tickets are non-transferable and non-refundable. 7]. What is KLUB KCON and how do I purchase a ticket? KLUBKCON is the official pre-event of KCON where you can dance the night away (on Friday August 18, 6-10PM) before you get ready for two star studded nights of MCOUNTDOWN concerts! There will be a special guest appearance from the concert lineup and more! Tickets are $30 each and you will be able to purchase them during the “additional options” section when purchasing your Convention tickets. 8]. Do I need to purchase a convention ticket in order to attend the artist engagement sessions? YES! The artist engagement sessions are located IN the Convention so you’ll need to purchase a Convention ticket! 9]. Do I have to buy tickets right at 10AM PDT/1PM PDT? Will the convention tickets run out? Don’t worry! The Convention tickets are not limited and we want everyone to join in on the fun! If you’re unavailable at that time, you can purchase them whenever you’re free! We do advise you to purchase them before KCON LA so that you’re prepared for check in at KCON LA! If you are not able to purchase them before the event, you will be able to purchase them on site as well! 10]. Can my legal guardian purchase my ticket even though they are not going? Yes! Just make sure they “sign” the “Minor Attendee Approval” waiver if you’re under 18 years old! 11]. Are there any additional fees for convention tickets? There is a processing fee of .99 cents for each Convention ticket purchased. 12]. If I bought the concert tickets for me and my friends do they need to buy their own convention ticket? Yes! Even though the concert tickets were purchased under your name, each individual must register online and buy a Convention pass! 13]. How do I get my convention ticket? Your Convention ticket will be sent to the email you input while purchasing your Convention ticket online. If you purchased additional Convention tickets for your friends or family under your account, they will receive their respective Convention ticket TO THE EMAIL THAT WAS INPUT FOR THEM during the transaction. 14]. What do I do with my confirmation email that contains my convention ticket once I receive it? Make sure you save it on your phone or device or print it out! You will need your Convention ticket when you check in on-site at KCON. 15]. How do I check in and receive my convention wristband or artist engagement benefits (if applicable)? You can check in for KCON when you arrive at the Los Angeles Convention Center! You will need your confirmation email (printed or on mobile) as well as your concert ticket(s) if applicable in order to receive these items at check in. 16]. When is check in? 17]. Can I check in my friends and family at KCON LA and get their artist engagement benefits for them if they can’t make it to early check in? Yes! In order to check in for your friends or family, you need their AXS Concert Ticket(s) AND their confirmation email that contains their Convention ticket QR code and signed waivers. 18]. What do I do if I never received a confirmation email? 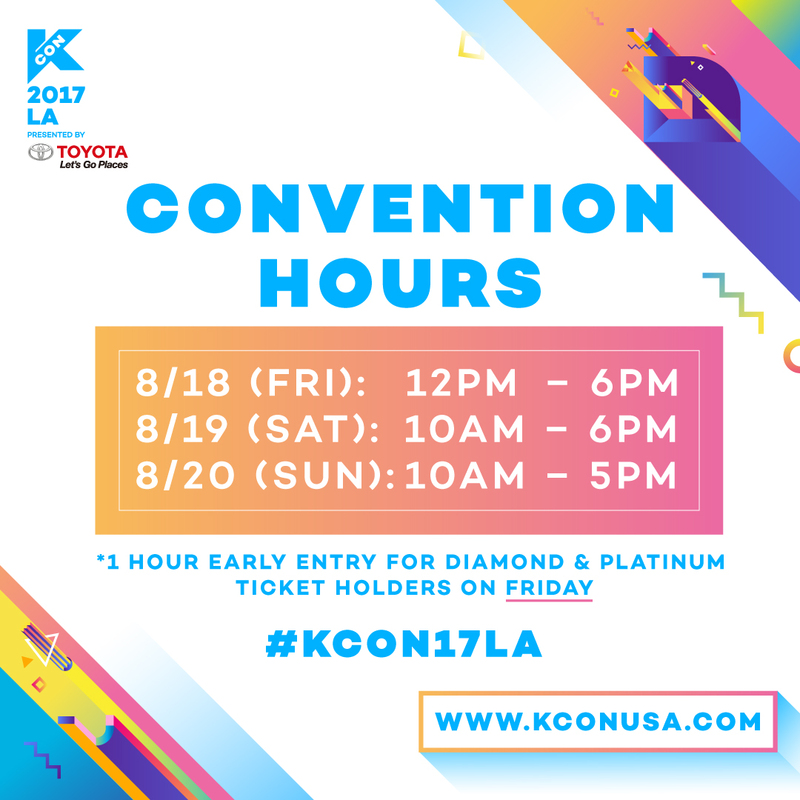 Please email questions@kconusa.com with the subject “KCON17LA Convention Confirmation Email.” We’ll also be sending everyone a reminder email before that includes their Convention ticket days before the event, so be on the look-out for it! 19]. What if I decide to attend the Flower Boy Café or KLUB KCON AFTER I already purchased my Convention ticket? Can I purchase them? Yes! You will log into your account with the username and password you created when purchasing your Convention ticket. From there you will be able to go to the “Additional Options” section and purchase Flower Boy Café sessions (if available) and your KLUB KCON ticket! Don’t forget to process the payment when you’re done adding the Additional Options, otherwise your Convention ticket will not work! We hope that helped with any unanswered questions you may have! Be on the lookout for more special guest announcements and the programming schedule! 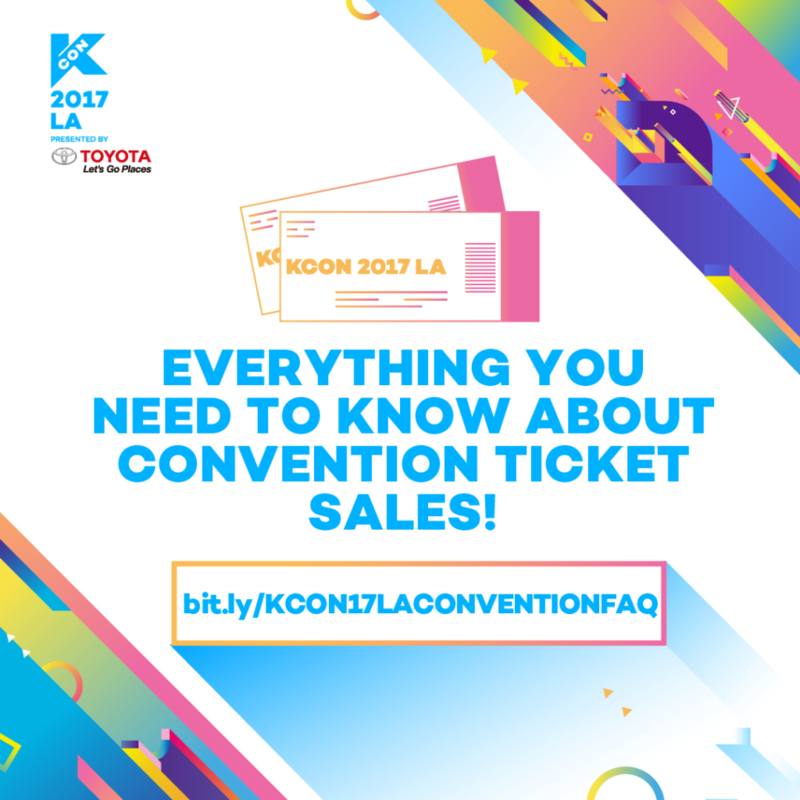 If we missed something, please check out our generic FAQ as well or feel free to message us on our social platforms or questions@kconusa.com!